Hello Trainers! This is a basic guide to help the community successfully create private and public trades. What is a private trade and do I create one? Private trades are trades sent privately to one trainer. Generally private trades are used between friends or trainers you may meet in the in game lobbies. If you would like to make a trade with a specific trainer, private trade is the method to use. The first step to making a private trade is making sure the cards or items you want to trade from your collection are marked for trade. 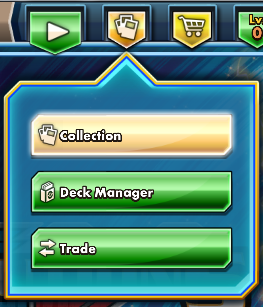 Enter your collection by clicking the Cards drop down menu located at the top center of the screen. After opening your collection, navigate to the card or item you would like to mark for trade. Here we see a Caterpie with a few options on the right edge of the card. 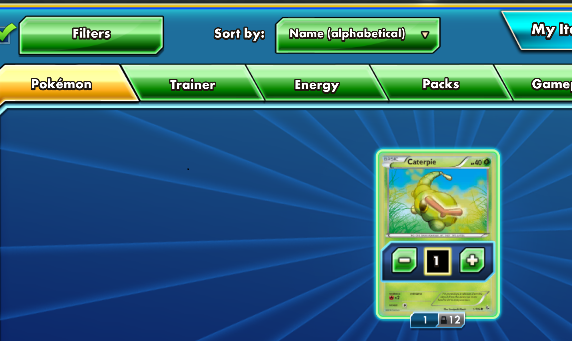 Clicking the top option will mark the card for trade and allow other trainers to view it and ask for it. You can mark as many cards as you want for trade. Remember, the cards will only be traded if you take extra steps to create a trade. After you are done marking cards for trade, you are now ready to create a trade! Navigate to the trade section by clicking the Cards drop down menu located at the top center of the screen. On the trade screen you will find a button in the top right called "Create Trade". Click this to get a trade started. 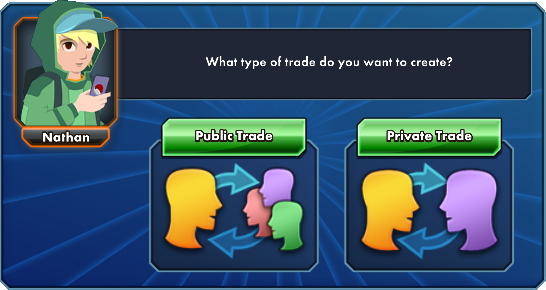 A new screen will pop up asking if you would like to create a public or private trade. Let's click private to create a private trade. The next screen will ask if you would like to trade with someone from your Friends list or a Public trainer. The Public option will not create a public trade. It will allow you to make private trades with trainers who are not added to your friends list. Both methods are nearly identical but for this example we will use the Friends option. 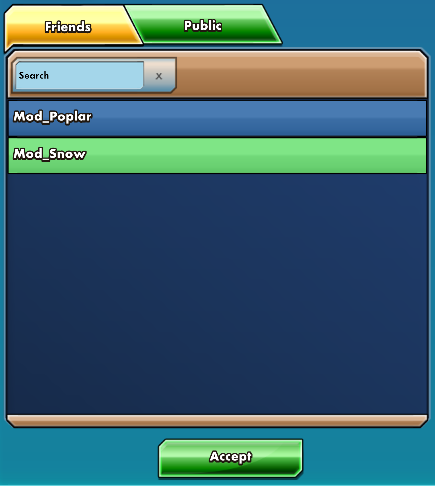 Go ahead and click the name of the friend you wish to make a trade with and then hit Accept at the bottom. Now we are presented with the Create Private Trade screen. This screen is divided into 3 sections. The top left section is for items you are wanting to get from a trade. The top right section is for items you are wanting to give in a trade. Clicking the top right section will display the items in your collection that you have marked for trade. You can view these items and add them to the trade by using the bottom section of the screen. Clicking the top left section will allow you to view items your trade partner has marked for trade. Once the top left section is clicked, you can browse your trade partner's marked for trade items in the bottom half of the screen. Let's start by adding a card to the trade from our collection. Click the top right section of the screen to activate the bottom section which will display the items you have marked for trade in your collection. The bottom half of the trade create screen has a variety of options and filters to help trainers trade as efficiently as possible. As your collection grows larger, the filter becomes a great tool to use. The different tabs are fairly self explanatory. You can use these tabs to find different types of items from your collection that you have marked for trade. This means booster packs will only show on the Packs tab and so on. Here we see the Caterpie we marked for trade a few steps ago. Clicking the card you wish to trade will display -/+ options. You can use the + button to add a copy to the top right section of the trade screen. The - button will remove items added to the top right section. You can also double click or drag and drop the card or item from both the bottom section and top sections to add or remove items from trade. After you have added the items you wish to trade, click the top left section to ask for cards. The top left section is the section you will use to ask for cards. 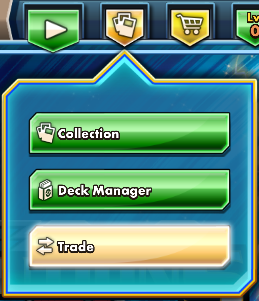 You can add or remove cards to the trade using the same methods as you did in the top right section. Keep in mind that your trade partner will have to mark the cards or items you want to trade for in order for you to view them. After you are done adding cards to your trade, we can move on to completing the trade. Before we create the trade, we always want to review everything. 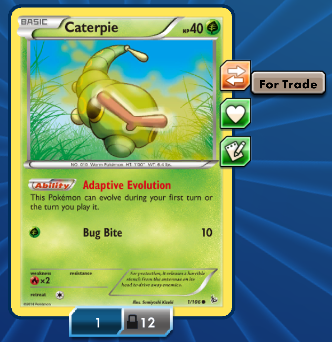 For this trade I will be sending Mod_Snow a Caterpie for 2 Beartic cards. As you can see, the Beartic has a +2 on it meaning I am asking for 2 Beartic cards. The Caterpie has a -1 on it meaning I am trying to give 1 Caterpie from my collection. You will also notice at the top of each window it has a total number of items being given from each trainer. After you are satisfied with reviewing your trade, we can now send it. In the top right corner of the trade screen you will see a few options. One option is an eye that if clicked will allow you to further review your trade before finalizing. This option is useful for large trades that have several different items. You can use this option to scroll through items that have been added to trade from both parties. We recommend double checking your trade with this option before making any trade. Another option is the red X. If you click this option you will be prompted with a window asking you if you would like to discard the trade. Discarding a trade will remove all progress of the current trade you are creating. This option will allow you to exit the trade and start a new on from scratch if needed. If you are happy with your trade, click the Done button and your trade will be sent! You should be prompted with a window congratulating you on creating a trade offer! The last step is waiting for your trade partner to accept the trade. If you ever wish to cancel the trade, you are allowed to do so as long as your partner has not accepted it yet. How do I retract or cancel a trade? If you would like to cancel a trade you have created, you can do so by navigating to My Trade Offers and double clicking the trade you wish to view. A new window will open up with the option to cancel the trade. After clicking Cancel a message will pop up confirming you have cancelled the trade and you will see the trade disappear from My Trade Offers. How do I accept or decline a private trade sent to me? Clicking the Offers to Me tab will allow you to view trades that trainers have privately sent to you. You can double click the trades to view them in a new window. From there you can either accept or decline a trade offer. How do I review my completed or cancelled trades? The Trade History tab will show a list of all trade activity recently involved with your account. It will show everything from completed to cancelled trades. 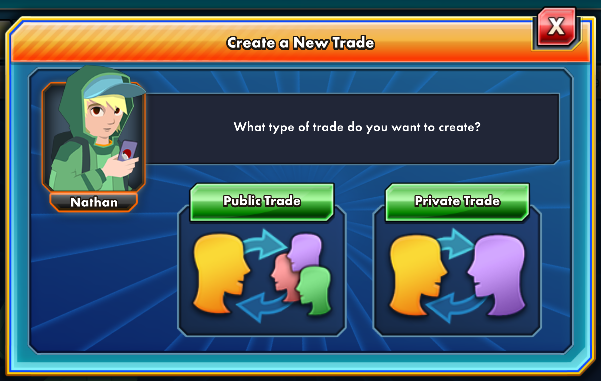 What are public trades and how do I view them or create one? To view public trades, simply click the Public Offers tab. From here you can see all public trades created by all trainers in game. Unlike private trades, public trades are open to anyone to accept as long as you have the items listed in the trade. Acceptable Trades Only is checked by default. Unchecking this will allow you to view trades that you can't accept because the trades ask for items that your collection does not contain. Unchecking this option can be useful at times to see what others are asking for things. Public trading will allow anyone in game who has what you are looking for to see your trade and possibly accept it. Creating a public trade is very similar to the steps taken to create a private trade. First, click the Create Trade button and then click Public Trade on the window that pops up. From here you can follow the steps listed to create a private trade. You will still need to make sure you have your items marked as trade. In the I Am Getting, top left section of the screen, you can ask for anything you wish for your items. Since this is a public trade, all items in game are available as a choice. The same steps apply for for public trades & private trade for viewing the trade before completion, and cancelling the trade if needed after the trade has been sent.